Thanks to Recovering Nonviolent History, it’s not too late to celebrate — and draw the beckoning conclusions from — the nonviolent American Revolution. After a peripatetic life careening around Europe in the mid-19th century, a penniless Karl Marx spent long years at a desk in the British Museum writing Das Kapital, a work that laid out the economic laws of capitalist society — and would go on to have a vast impact globally through most of the following century. What would the history of the past hundred years have been like had the Marxian engine toward the classless society been nonviolent people power rather than violent class struggle? What if a character more like Gandhi had staked out that desk in London — fresh, perhaps, from the movement that successfully ended British slavery — and churned out a text offering a diagnosis every bit as apt as Marx’s (perhaps not unlike the Mahatma’s own analysis of global capital in his still-useful 1909 tome, Hind Swaraj, or Indian Self-Rule), but with a radically different method for proceeding? On another level, though, this kind of speculation might get us to wonder about what is being written now — and its potential consequences. Is there, for example, a Gandhian Marx somewhere, perhaps in exile and penury, dutifully plodding away at the Nonviolent Das Kapital — a book that will breathlessly capture the imagination of people across the planet and go on to function as a template for the operating systems of whole societies in the next generation, or the next century? We haven’t seen this definitive text yet. Maybe we never will. Perhaps something like Marx’s book was so unique that it proved to be a historical one-off, so that even considering this possibility is a time-wasting detour. Or maybe books have had their day, and something else is going to come along to take their place. If, however, this decisive volume does spring itself on humanity, it may be because the ground has been laid. First: the gathering momentum of nonviolent people power movements around the globe has nudged even the most skeptical observers to somehow take notice. It is the experience of public and engaged nonviolence, especially over the past half century, that has prompted concerted attention, just as the experience of violent revolution in Marx’s day prompted sociological focus. Second: an increasingly powerful lineage of nonviolence research and analysis has created a growing stream of books that have gone a long way in establishing not only a discipline but a genre. From Gene Sharp’s 1973 ground-breaking three-volume The Politics of Nonviolent Action forward, we are living in a time of immense data-collection and writing on the dynamics, methods and history of nonviolent change. In every case, scholars burrow into the experience of each society — generally over a time-frame of decades or even centuries — and identify often forgotten or repressed nonviolent movements that displayed a wide repertoire of tactics and which typically enlisted people from across society. These campaigns have often been central to the creation of parallel institutions, traditions and practices of civil society, and frameworks for participatory post-conflict societies. 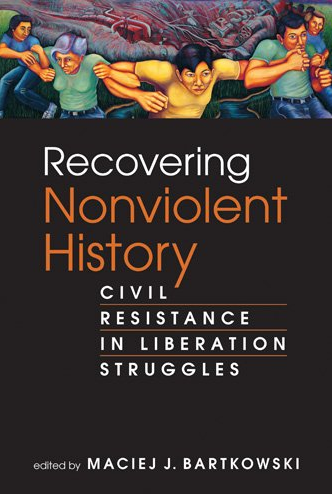 In fact, one of this book’s key contributions is its focus on how nonviolent strategies have been central to the identity formation of emergent societies and nations both during and after liberation struggles. In some of the cases studied here, nonviolent campaigns have existed alongside armed struggle. Often, the memory of civil resistance has been obscured or even suppressed for a variety of ideological reasons (by regimes who consider violent combat more patriotic or whose own violent strategies are legitimated by a violent origin) or scholarly methodological biases. By focusing on nonviolent civil resistance, the book’s contributors illuminate an often forgotten history, but also demonstrate how key these efforts were to successful liberation movements. Two sections of the book have particular resonance this week. The chapter on Egypt sheds light on the roots of this past week’s renewed pro-democracy marches and rallies. And the chapter on the birth of the United States throws in new relief the Independence Day celebrations taking place across the nation today. 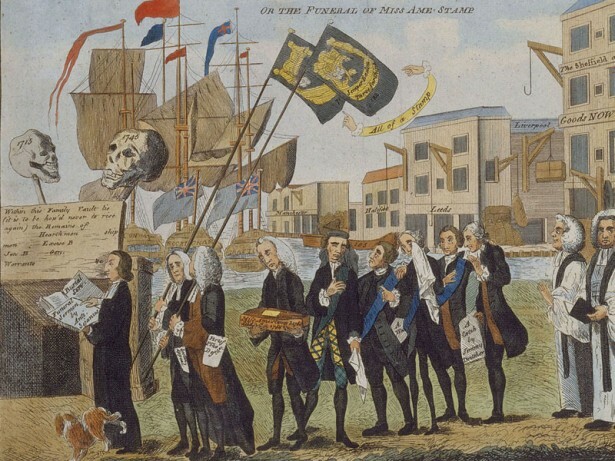 Benjamin Wilson, The Repeal, or The Funeral of Miss Ame-Stamp (London 1766). If the nonviolent strategy was successful, why did the Americans resort to military operations in late 1775? Conser’s answer is that the colonists “underestimated or misunderstood the gains that the nonviolent resistance had achieved” and that the Second Continental Congress recruited European allies who drew on their experience to craft a military strategy. The same Congress proceeded to form an army. While Conser judges this a shift in strategy, Jonathan Schell in his book The Unconquerable World: Power, Nonviolence and the Will of the People, frames it slightly differently. Schell, also working from letters by John Adams, asserts like Conser that the revolution was nonviolent. Once it was won, Schell says, the newly sovereign United States moved to defend itself militarily from “a foreign power seeking to force the new country back into its empire.” Schell quotes Adams as he takes umbrage at long-retired generals conflating the two in their memoirs. When Adams learns that Congress has hired a national painter, he argues that the paintings should be scenes of protest. History is what actually occurred. But what if what actually occurred turns out to be different than we thought? What if what sounds like literary counter-history turns out to be true? Maybe the great, definitive, earth-shaking tome of nonviolence that we are anticipating is actually history itself, waiting to be parsed with finer and finer precision and surprise. The United States may have turned out differently if its nonviolent origins had been taught, acknowledged and taken to heart over the past two centuries. But there’s no time like the present. Thanks to Recovering Nonviolent History and The Unconquerable World, it’s not too late to celebrate — and draw the beckoning conclusions from — the Nonviolent Fourth of July. When I first learned about non-violence in 1976-’77, The Power of the people: active nonviolence in the United States, by Robert Cooney, Helen Michalowski was freshly out, and it painted exactly this picture– that social change was like an iceberg, and we mostly concentrated on the violent tip, instead of the massive people’s solidarity beneath it. Also newly out was Moving Towards a New Society, which uniquely blended nonviolence, small community building & group process, feminism, global anti-imperialism, simple living and ecological thinking into a coherent package. Thank you for this. For those of us less than eager to celebrate the mythology of military triumph on days like today, it’s so, so important to recall and retell these stories. I’m not sure, however, I would’ve chosen Das Kapital as the foil to Gandhi; it’s a work of political economy outlining self-contradictions of capitalism, and I think it’s as much a potential contribution to our nonviolent history as to the legacy of violence. What might be more relevant are the history lessons that Lenin and Stalin absorbed that made them extrapolate from Marx’s imagined “dictatorship of the proletariat” to a truly murderous, militarized dictatorship — to place their faith in the supposed efficacy of violence rather than in the will of the people. I have believed for a long time now that the anti-corporate, anti-big business movement in our American DNA can be framed in a helpful way by remembering the original Boston Tea Party of 1773. The colonists were fighting against the global corporate behemoth called the East India Tea Company. The colonial economy was in trouble because this global business was undercutting the price of tea and the many “tea shops” the Americans owned and frequented. Tea was the “real deal” back then. It was a necessary part of the culture.